Nasturtium plants are loved for their rich, saturated, jewel-toned colors. They are fast and easy to grow and do best with a little neglect. There are varieties for almost every gardening purpose: bushy plants for borders and edges, trailing plants for walls and containers, and climbers to add dramatic height in a garden. The leaves and flowers are edible, with a peppery tang, and even the seed pods are used as a substitute for capers. Nasturtium plants (botanical name: Tropaeolum) grow full, with lots of bright green leaves and spots of brightly colored blossoms poking out of the masses of foliage. Their leaves are rounded, like a water lily's, and the flowers have an open funnel shape with a curious little claw or spur on the underside. These flowers can vary, but the most popular versions are yellow, orange, pink, red and mahogany. There are also varieties in subdued shades of butter yellow and cream. The "Alaska" Series and the climbing "Jewel of Africa" have variegated leaves. Some varieties of nasturtiums are perennial in USDA Zones 9 through 11, but most are annual plants, growing from seed to seed in one season. As with most plants, the mature zone will vary depending on the type of nasturtium you plant and the growing conditions. Nasturtiums will grow in either full sun to partial shade. They will bloom best in full sun, but the plants prefer not to be in extreme heat. Expect flowers from early summer through fall in cooler climates. In milder growing conditions, nasturtiums bloom fall through spring and tend to fade in the summer heat. Nasturtiums are usually started from seed, so you won’t often find them available as plants at nurseries. However, the seeds germinate quickly and the plants will be up and blooming in no time. Seeds can be sown directly in the garden when the soil has warmed or started indoors about 2 to 4 weeks earlier. Nasturtiums don’t especially like being transplanted, so starting indoor seedlings in peat or paper pots will reduce transplant shock. Once planted, they tend to take care of themselves. Nasturtiums will spill beautifully over walls and onto pavers when used as edging plants. They also hold up well in containers. Climbing varieties will amble up and through shrubs. Bushy, ground-hugging nasturtiums will fill in blooming gaps among complementary colored daylilies and roses. You can use clusters to brighten up the vegetable garden. One thing to be aware of when choosing which nasturtium to grow is that the flowers of some varieties can be obstructed by their amble foliage. If you are growing your nasturtiums at ground level, choose one of the newer varieties that hold their flowers above their leaves, so you can easily see them. Alaska Series: Bushy dwarf plants with heavily variegated foliage and blossoms above the foliage. Jewel Series: Bushy dwarf with double and semi-double blooms. A profuse bloomer, but flowers can tend to get lost under the foliage. Peach Melba: Bushy dwarf with semi-double buttery yellow flowers splashed with orangy-red centers. Good for containers. '"Canary Creeper" (T. Peregrinum): Perennial vine in the nasturtium genus, with yellow flowers that look like a bird’s wings. Nasturtiums like regular weekly watering. They will survive some drought conditions, but flowering will diminish and the foliage can begin to look ratty. Deadheading is not necessary unless a plant has been stressed and is holding on to spent blooms. 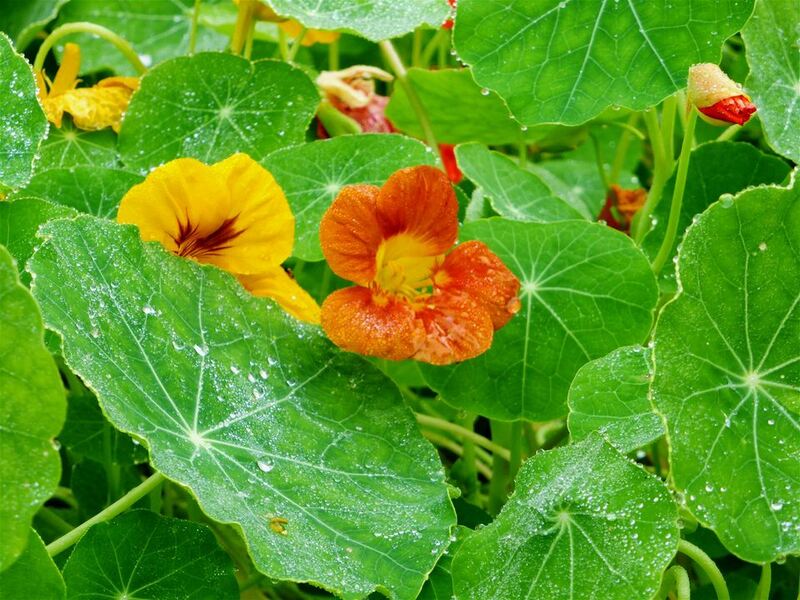 Don’t feed nasturtium plants at all during the growing season. They thrive in lean soil. Fertilizer causes them to put out more foliage and fewer flowers. Nasturtiums are very prone to aphids and are sometimes used as a trap crop in vegetable gardens. A strong blast of water is usually enough to get rid of the aphids. They can also be prone to flea beetles, slugs, and the caterpillars of cabbage white butterflies.